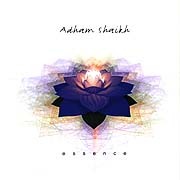 The music of Adham Shaikh hits the listener on several different levels. Take for instance the track "Sabadhi", found here on the album Essence. Opening with a cerebral sprinkling of crystaline tones over gentley coursing synth pads and sparkling piano notes, the emphasis of this piece migrates slowly from the head down to the heart with the introduction of a beautiful flute solo above an underflow of loping percussion accents. Another moment on and it's hard not to feel this music move to the shoulders, hips and feet as a big warm bassline drops in and layers of exotic percussion move through. The overall feel of the piece draws from Shaikh's "dub" influences, but develops beyond the basic by providing the open and active listener with music that eventually influences the mind, body and spirit simultaneously. The track "Orcadrfit" moves through the listener similarly. The splashing water looped into a rhythm serves as an introduction for the reverb soaked piano. Rainstick washes, shakers and other more electronic beats emerge. But the soul of this work lies in the magnificient violin solo samples lifted from Lisa Walker's Grooved Whale album and provides the warm areas of this cool ride. The remaining tracks on Essence deal more with the well populated middle than with we floaters on the fringe. The music is equally intricate and engaging as Shaikh explores less the ethereal aspects of dub than this style's propensity for elasticity and energy.